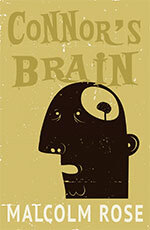 Just finished a new Young Adult thriller as a companion to CONNOR’S BRAIN. The story has taken me by surprise. Once I got to understand Sophie, the main character, and the trauma she suffered as a young girl, she led me into dark and unexpected places. Really pleased with the story. CHASING THE RAPTURE will be out in May. Sophie has the same doctor as Connor in CONNOR’S BRAIN so I guess I could have called the new book SOPHIE’S BRAIN but CHASING THE RAPTURE is more exciting. Scroll down for info and cover on CONNOR’S BRAIN. Have you seen THE OUTER REACHES? 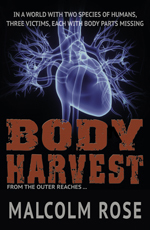 This is a 4-book series of strange murder stories and it begins with BODY HARVEST. Two 16-year-old detectives – Troy Goodhart and forensic specialist Lexi Iona Four – are faced with a horrible find of three bodies (perhaps four, it’s hard to say) in a wood. Troy is a human like you and me. He’s a major. But Lexi is an outer. She belongs to the other human race that exists alongside majors. This adds tension and humour as they go about their investigation of the bodies which have various organs missing. 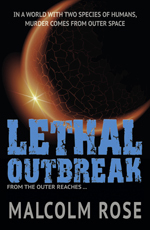 The second book is LETHAL OUTBREAK. Three scientists wearing protective suits are found dead in a sealed, high-security laboratory. An accident with a soil sample brought to Earth from Mars, murder or something worse? 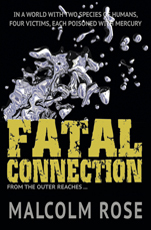 In FATAL CONNECTION, four majors die from the gruesome symptoms of mercury poisoning. But they live in different parts of the country and don’t seem to have anything to do with each other. Troy and Lexi have to find the fatal connection before they can solve this one. 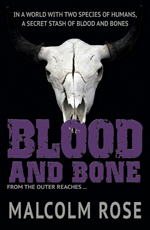 In the fourth book, BLOOD AND BONE, Troy and Lexi find a secret stash of blood, bone, brains and other parts from endangered tigers and rhinos. Someone is slaughtering endangered animals to feed the illegal trade in so-called natural medicine. The same gang will threaten anyone who gets in their way. I hope this series will appeal to fans of my TRACES books. All of the TRACES novels - including the 7th, MURDER CLUB - are available as ebooks from Amazon right now. I hope you enjoy my site. If you click on BOOKS, you’ll get a list of my novels, cover designs, blurbs and reviews. If you want to review one of my books, you can do that as well. There’s a way of contacting me too. So, if you’re trying to get hold of one of my older hard-to-find books, you can check if I’ve got a copy for sale. Or you might just want to ask me a question. If lots of you ask the same question, I’ll put it – and my answer – in the FAQs section. Before you write and ask me a question, please check if the answer is already in the ABOUT MALCOLM, FAQs or BOOKS sections of this site. That way, you’ll find the information much quicker. I try to respond to all messages but occasionally someone’s email provider refuses my reply. Either some filters are a bit too protective or there’s a spelling mistake in your email address. If you want a reply from me, please make sure you type in the right email address. By the way, you can click on the latest covers in the Books section and go through to Amazon where you can buy the books. Yeah, I know it’s a bit commercial but some of you might appreciate it. My best ever book? Possibly. It’s called CONNOR’S BRAIN. A virus invades the brain of a teenage Connor and strips him of memory, language and a sense of time. He doesn’t even recognize or remember his friends and family. None of them knew what was on Connor’s mind before the virus attacked. And now Connor doesn’t either. He has forgotten what happened to Joy and girls like her. As he rebuilds a life for himself, there are people who need to make sure he never remembers, who do not want his brain to mend. Just a word of warning. CONNOR’S BRAIN is a Young Adult book with some explicit scenes. There are some new gruesome murders in four books in THE OUTER REACHES series. It’s a bit weird. Two different human species live side-by-side in the world: majors and outers. It’s as if Neanderthals had survived and evolved alongside us (majors) and become outers. The two races look similar, but they have different talents and different genetics. The detective duo is Troy Goodhart (a major boy) and Lexi Iona Four (an outer girl). Both are sixteen. Troy is good with people, Lexi is good with forensic science. Together they tackle some bizarre crimes, starting with BODY HARVEST. For all fans of my TRACES crime series, there are now seven ebooks in the series. All available through a major online bookstore! You can find them all by clicking on BOOKS. SHADES is a series of short books that are strong on drama, pace and style. The SHADES books are ideal for readers who prefer their stories to be a snack rather than a big feast. FOUR DEGREES MORE is an environmental thriller that opens with a boy called Leyton watching his bedroom fall into the sea. It’s all about coastal erosion and global warming. So what does Leyton decide to do about it? He gets caught up in a green campaign that turns out to be rather more sinister than he had bargained for. ANIMAL LAB has the theme of animal rights – and animal wrongs. It’s all about a controversial part of science and medicine: animal experiments. My third book for SHADES is ASTEROID. For years, I have put individual characters under threat in thrillers and crime stories. In ASTEROID, I decided to threaten the whole of humanity with extinction through an asteroid strike on Earth. Nature is far more powerful than us humans and this novel shows it!